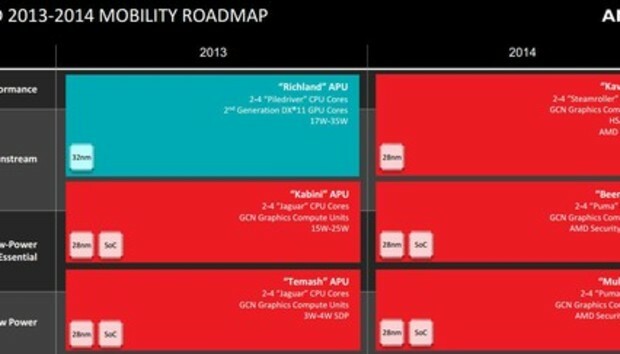 AMD Wednesday promised a 2013 roadmap that pushes power consumption down to the level of rival Intel's latest Atom chips. The company also added dedicated security features that address how corporate workers bringing personal devices into a business environment. The three pillars of AMD's mobile roadmap will be three chips: "Kaveri," AMD's first chip designed for heterogenous computing; "Beema," a low-power chip that adds the security processor; and "Mullins," another security-enhanced chip that drops power down into the 2-watt range. All three are technically APUs, combining CPU and graphics logic. All three are designed for the convergence of PCs and tablets, where mobility and low power are prized as highly or more so than traditional performance metrics, said Gabe Gravning, AMD's director of client marketing. "I think it's clear to everybody that there's an inflection point in the market," Gravning said. "2014 will be a shakeout year for form factors," where the market collectively decides what computing devices they'll want to carry around for the next few years, he said. AMD disclosed the new roadmap at its APU13 conference in San Jose, where the company is attempting to cement relationships with existing customers and developers as well as to forge new ones. Although AMD has traditionally favored a top-to-bottom approach from servers on down to low-power devices, its new chief executive, Rory Read, has chosen to emphasize particular segments that include semi-custom ultra-low power clients like PCs tablets and game consoles; embedded devices; dense servers; and the professional graphics market. And that approach has paid off: funded by design wins in each of the major game consoles, AMD returned to profitability in its most recent quarter. The performance tier of AMD's 2014 laptop offerings will be addressed by the Kaveri chip, which AMD recently disclosed would be released first for desktop PCs. Kaveri uses a Heterogenous Unified Memory Access (hUMA) architecture, a technical name for a shared pool of memory between the GPU and CPU that promises to increase performance. Beema will consume between 10 and 25 watts; an improvement over 2013's Kabini APU, which used anywhere from 15 watts to 25 watts. On the surface, "Mullins" is identical to Beema, but drastically lowers the power envelope to about 2 watts. Although Intel plans to take variants of the Bay Trail into smartphones, Gravning said "that's not a target with Mullins, no". Analyst Dean McCarron noted that in the Windows tablet market, both AMD and Intel's X86 chips will go head to head. But in the larger tablet space, AMD and Intel are up against a number of low-power ARM chips. "X86 is on the outside looking in," McCarron said. Both Beema and Mullins will use two to four cores. All three chips--Kaveri, Beema, and Mullins--also will include "GCN Graphics Compute Units," graphics cores that can do double duty as compute engines. Both Beema and Mullins will also contain AMD's first ARM-based security processor logic, a partnership struck in June of 2012. The Cortex-A5 processor at the heart of the security processor uses the ARM TrustZone security technology to create a trusted environment that could be used for a variety of purposes, Gravning said, including creating a trusted environment for a corporate environment. On the consumer side, the AMD Security Processor, as it's known, could be used as additional security for online purchases, assuming a developer taps into it, he said. Intel has built in its own security technology since 2007. The Trusted eXecution Technology was added to the Core 2 Duo chip, and is marketed as part of Intel's vPro solution for businesses.